Every now and again, someone asks, “What does a priest do all day?” assuming basically that we don’t do much after we finish Mass. I jokingly answer, “I stand by the window with my hands in my pockets, wondering when something will happen or if someone will come by”—Could you imagine how dreadful this would be if actually true? In this time of crisis in the Church when bishops aren’t acting as bishops, nor are priests acting as priests, lay people aren’t trying to become saints, and Catholics aren’t evangelizing, we need to remember who the priest is called to be. The Second Reading, the Letter to the Hebrews, is about Jesus’ priesthood. Jesus is our high priest and Catholic priests merely participate in His priesthood. And what does He do all day? It says, “He is able for all time to save those who approach God through him, since he always lives to make intercession for them” (Heb 7:25). Old Testament priests, called Levites, “were able to ‘save’ people only in the sense of providing temporary ritual cleansing from impurities and sins” (Mary Healy, Hebrews in Catholic Commentary on Sacred Scripture, 144); they would offer sacrifices of animals. Yet, the blood of irrational animals can’t take away moral failings (Cf. Heb 10:4; 9:13-14). Jesus, however, can take away sins. That’s because sin is a choice of disobedience, correct? So, Jesus counteracts this by making the greatest act of obedience of laying down His life for us (Cf. 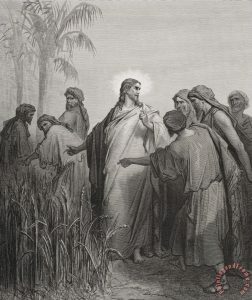 CCC 615), and, being God, He could join all of us to Himself and thus redeem us (Cf. CCC 616). Jesus, as our high priest, saves us from sin—that’s what a priest does. We’ll talk more about this in two weeks. The second part of the above Scripture verse says that He “always lives to make intercession for them.” This doesn’t mean He changes God’s mind so that God is merciful to us. God is already merciful; in fact, God looks for people who will share in His own solicitude for sinners. There’s this famous idea in the Bible about standing in the breach. 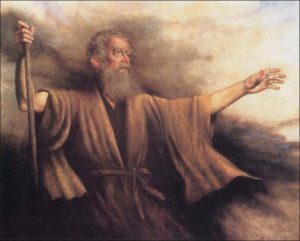 It says in Psalm 106:23 that Moses stood in the breach between God and the people; he was a mediator; and Ezekiel 22:30 says that God actually looked for someone to stand in the breach. Now God has made His own Son that person. That’s what Jesus does all day: In heaven, He continues to offer Himself to the Father on our behalf, and that’s what a priest does. The most important action a priest can do is to offer Mass for people (CCC 1566), because that’s when we make present again Jesus’ sacrifice and allow people to come to wellsprings of salvation. After that, he’s a mediator in Confession. I dream of the day when Fr. Pierre and I can hear confessions all day long every Saturday! But that depends on whether or not we can get more lay people to step up, become leaders, and take over some of our duties. In addition, a priest promises to pray the Liturgy of the Hours. Mass is divided into two parts, the Liturgy of the Word and the Liturgy of the Eucharist. 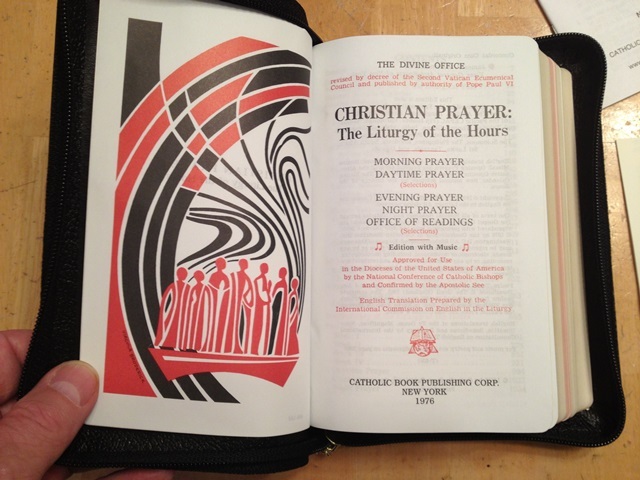 Outside of that is the Liturgy of the Hours, which is prayed five times a day, taking just over an hour in total. We pray all 150 psalms every four weeks and offer them on behalf of other people. o Office of Readings: My mother, true marriage and family, the evangelization of the nations and our neighbourhood, our parish, the poor, refugees. 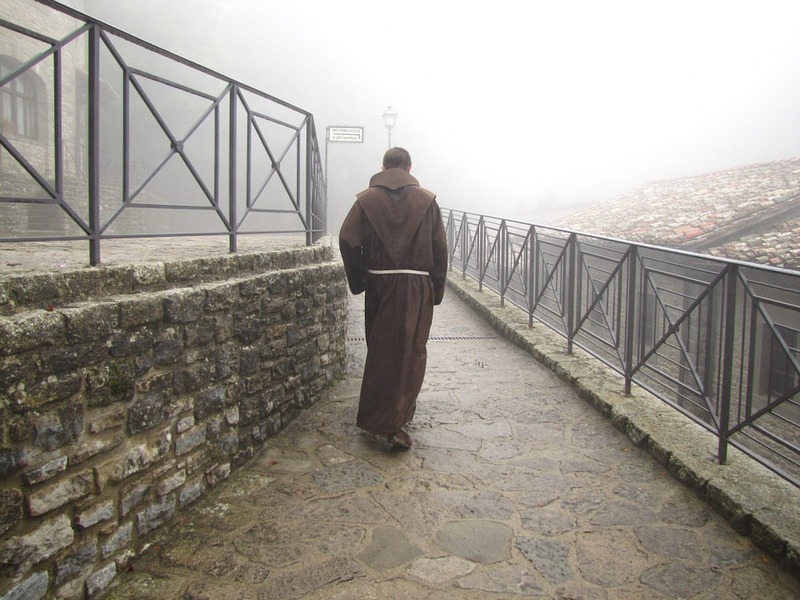 o Morning Prayer: My eldest brother, pro-life efforts, an end to abortion, euthanasia, starvation, malnutrition, terrorism. o Midday Prayer: Deceased family members, my two aunts, extended family, the Senior Leadership Team. o Evening Prayer: My middle brother, Pope Francis, Archbishop Miller, clergy, religious, lay leaders, presbyterate of Vancouver, more vocations. Maybe you can help me add to my list so that it’s more comprehensive. Beyond this, there are the sacrifices priests offer in terms of sufferings and fasting. In addition, hours and hours are spent writing homilies and talks; preaching, by the way, is what Vatican II called our “primary duty,” because “no one can be saved who does not first believe” (Presbyterorum Ordinis, 4). It is such a joy to proclaim God’s truth and love, which, in turn, changes lives. Then we lead the parish, meeting with people and guiding them, and guiding all the ministries of the parish. A priest participates in Christ’s priesthood, so he is meant to spend himself unto death for the good of others. St. Bernadine died of exhaustion; St. John Vianney pushed himself beyond his limits in serving the people; Ven. Fulton Sheen always said that a priest is also a victim; St. Maximilian Kolbe, when he offered to the take of the place of a family man sentenced to death by starvation, was asked, “Who are you?” Did he say, “His friend,” “Maximilian Kolbe”? No. He said, “I am a Catholic priest.” For Jesus taught us, “The good shepherd lays down his life for the sheep. For this reason the Father loves me, because I lay down my life, that I may take it up again” (Jn 10:11,17). This is why I love the priesthood, why the whole world expects more from priests, and why, when a priest falls, it’s devastating. The Second Reading says, “It was fitting that that we should have such a high priest, holy, blameless, undefiled, separated from sinners, and exalted above the heavens” (Heb 7:26). Jesus has no sin, no spiritual defects, and cannot be affected by sinners. Priests should aspire to be like this, but the reality is every priest, including me, falls short, and some grievously. 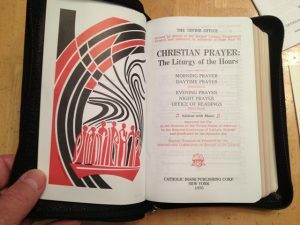 In 2001, a survey of American priests found that only 52.8% pray all or most of the Liturgy of the Hours (Fr. Stephen J. Rossetti, The Joy of Priesthood, 44)—that’s a disaster. Yet, why is this shocking? God is the perfect Father, and every human father falls short of this goal. The very moment a husband impregnates his wife, he falls short as a father. Every mother falls short of the ideal of the Blessed Mother. For this reason, priests need to go to Confession to other priests, as everyone else. So, should we give up on priesthood, fatherhood and motherhood? No, we should mature in our faith and response! We keep in mind what a priest is supposed to be and love it, but maturely realize that some priests are hypocrites, etc. St. Paul says, “We have this treasure in earthen vessels” (2 Cor 4:7). Why? Because, he adds, “To show that the transcendent power belongs to God and not to us.” Ah! This makes us realize that every good a priest does, comes from God, not him! Priests are merely instruments in God’s hands. Part of being a saint is being mature, so have a realistic love for the priesthood, not an exaggerated one. If a priest hurts us, that’s not Christ, that’s the man. Let’s do three things: 1) Pray for more holy vocations. As much as I have enjoyed jesting about Fr. Lucio, Fr. Juan, Felix, and Jerome, they are incredible young men and already have priestly hearts. Could we pray for more holy vocations like this, please? Let’s do so after the Prayers of the Faithful today. God is calling many men from this parish to the priesthood, but they need our mediation because there’s fear of following God, a fear of loss, and of making a mistake—none of this comes from God. I’ve kept the custom here of only male altar servers for one reason: that they think about a vocation to the priesthood, or, if they’re already married, to the diaconate (If you’re not married, don’t think about that one!). They should see up close what a priest does, and think, “Is God calling me to do that?” With this in mind, next week I’m going to invite them to hear confessions with me, so that they know with what kind of sins people struggle. Just kidding. 2) We said two years ago that there are two kinds of priesthood, the priesthood of the faithful (which we all have through baptism), and the ministerial priesthood (through ordination). Now normally I would ask help from all of you, but today I want to ask help from just the men. I’ve been thinking for a long time about joining “e5 Men,” which is a group of men who follow St. Paul’s advice in Ephesians, chapter five, about laying down their lives for their brides. 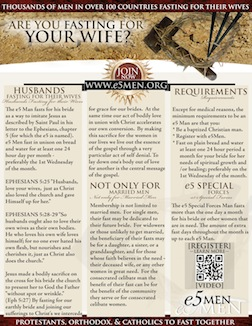 Men join this to fast on bread and water on the first Wednesday of each month for their wives, (and not bread with cinnamon on top or raisins inside—that’s cheating); and priests join for their bride, the Church. I need help from other men who will fight with me and hold me accountable. In your pews is a card on which you can write down your name and e-mail, and we’ll input it for you. Will you exercise your baptismal priesthood for your family the way I do for mine? Also, Archbishop Miller, two days ago, encouraged all parishes to pray the Prayer to St. Michael the Archangel after Sunday Mass. This is a traditional prayer for protection against the devil, and makes us aware that he’s attacking you and your spouse, your brothers and sisters, your parents, your kids, your friends, coworkers, this parish, and the whole Church. We’ll pray this right after the dismissal and then go into the final hymn. 3) Since baptism gives you all a share in Jesus’ priesthood, I’d like to encourage you parents again to bless your children and make the sign of the cross over them, as we mentioned three years ago. Start while they’re young, because sooner or later, they’ll be too cool to be blessed. At that point, you’ll have to resort to sprinkling them with holy water when they’re not looking. If we want better priests, start being a better priest at home. 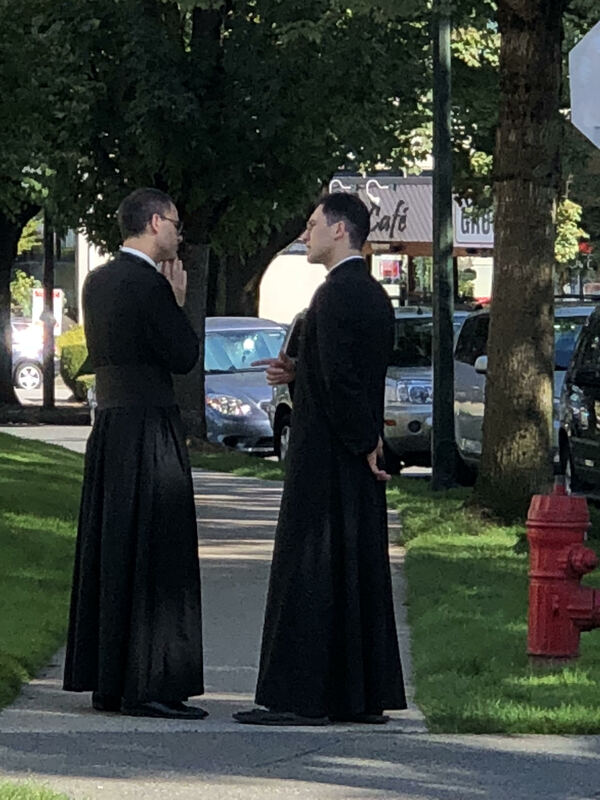 The priesthood today is in crisis. But I still love it, because I love Jesus’ priesthood and how He’s redeemed us. For the same reasons, I want to see it absolutely purged of evil and renewed. When priests actually imitate Jesus, miracles can happen. Everyone remembers Alec Guinness, the famous actor who played characters like Obi-Wan Kenobi? The first step in his choosing to become Catholic was in 1954 when he was 40. He was filming in France and was dressed up as a priest. 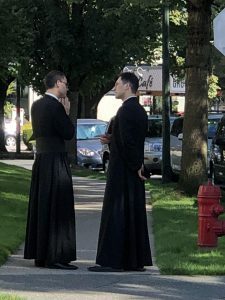 “While walking down the street in priestly attire, a local child spotted him and mistook him to be a genuine Catholic priest. The child ran up, grabbed his hand trustingly, and walked with him down the road. The trust and affection the child had for Catholic priests had a deep impact on him and made him start to seriously consider Catholicism.” Priests, we must admit, as a group, no longer deserve this trust. But it still points to where we should be. We need more prayer, fasting, and speaking out against the corruption in the Church. We need priests who will imitate the High Priest and spend their whole day making intercession for others.